Home / Latest Posts / IAMDV8 2014 AUDTIONS 12th FEBRUARY! GET INVOLVED! 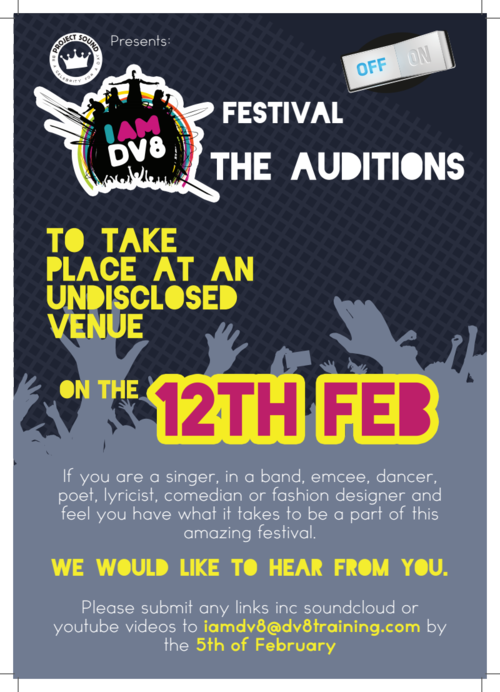 IAMDV8 2014 AUDTIONS 12th FEBRUARY! GET INVOLVED! DO YOU HAVE WHAT IT TAKES TO A PART OF THE IAMDV8 FESTIVAL 2014? Calling all singers, dancers, comedians, MCs, poets, lyricist, fashion designers and bands. IAMDV8 is on the look out for new talent to be part of their long-running youth festival. All previous events have been sold out with headlining acts such as Angel, Wretch32, Devlin, Chip, Griminal, Giggs, Ghetts and many more! So, if you think you have what it takes – audition now! Better get ya skates on at the deadline for submission is approaching! Rules: No promotion of negativity, original music only, audition slots approx. 5 minutes.